Aww, boys best friend. So relieved that Jurassic Park is fictional, or I have a feeling Syd would want a Petosaurus! When you have suitably captioned this dino pic, head over to the mother of them all, Mammasaurus, and do some more! Previous Post Chewits Cheap Half Term Tips and Chewie Giveaway! Mummy which button do I press to make it go? Mummmmmmm – can we take him home. Purleassssseeeeee! So what did you say? HOW old is this Mammasaurus? Woooooow! I see you’ve met my Great Aunt Betty there… Syd is obviously a boy of great taste being dinolover! I did wonder if it was any relation! Mummy! I think I can hear a heart beat! 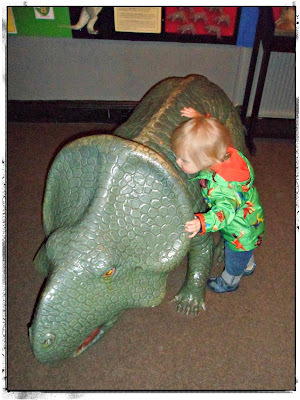 *whispers to dinosaur* d’you think Mum’ll notice if you come home with us and sleep in my bed tonight? He would definitely fit in my room – please Mummy, please?! when will it turn into a princesss then?